Abi Peett received her Duke of Edinburgh Gold Award from Adam Jollans, County Commissioner for Hampshire. To gain this award, Abi had to take up a new physical challenge (running), complete a 4 day expedition in wild country (Exmoor), complete 9 months of voluntary Service (in Scouting) and take part in a week long residential experience with people not known by her (she did this in Poland). Abi now holds the Duke of Edinburgh and Queen's Scout Awards. 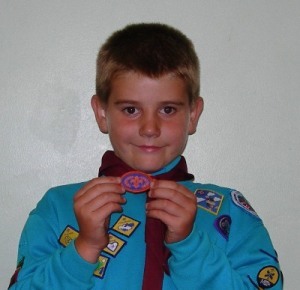 Congratulations to James Ferguson of Aspen Beaver colony on gaining the Chief Scout's Bronze Award. To complete this award, the highest for the Beaver Section, James completed the Promise Challenge, Creative Challenge, Community Challenge, Fitness Challenge, Global Challenge and Outdoor Challenge. 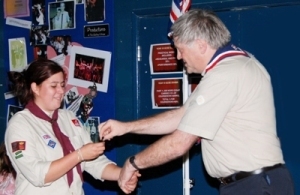 The Award of Merit is presented in recognition of an outstanding contribution to Scouting. Adam Jollans the County Scout Commissioner for Hampshire was delighted to be able to recognise the contribution of Paul (Jacko) Jackson over many years with the presentation of the Award of Merit. 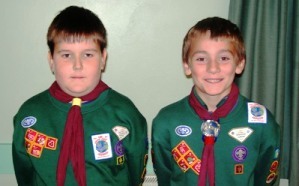 Jacko, who joined the Hayling Scouts as a Cub Scout and has been with us ever since. Along with being an Assistant Cub Leader, he is often found helping with other sections and is also a trained instructor in Archery and Climbing. Well done Jacko on this deserved recognition - we are all proud of you. Congratulations to Ben Grainger and Harrison Jobber on receiving their Chief Scout's Silver Award, the top of the Cub Scout section. The awards were presented by Nigel Valette, District Commissioner for Havant who congratulated the Cubs on their great achievement and thanked the Leaders and Parents for their help and support. Congratulations to Luke Houghton, Denis Doney, Tom Deans and Pete Rowson who each won £25 and Brian Bocking who won £50 in our 100 club. Congratulations to the North Island team who won our annual quiz and the Dreadnought Trophy with 62 points, beating current champions "ACE" by just 2 points. Our thanks to Ann & Ed Ault our scorers, to Mandy, Fiona and Jo for providing the hot supper and to our regular quiz master Billy Ault who each year manages to test all of our brains with a range of challenging questions. Thanks also to Stoke Fruit Farm for their continued sponsorship of this event, and to those who donated apples and raffle prizes and to Mandy Hawke for organising the event. Oh, and the event made a profit of over £750 for our transport fund - so a great weekend all round! Thank you to the 80 families who braved the threat of rain and the mud to join us for this year's display. Once again Pete Goddard and Tom Lincoln put on a great display and our catering teams were kept very busy. 23 members of the Group received a certificate from Councillor Gerald Shumbart in recognition of gaining their top awards as Beavers or Cubs. Thank you to the 75 Scouts, Explorers and adults who turned out for Hayling British Legion annual Parade of Remembrance. Well done to Matt Kenny, Edward Mill and Hakan Ustabas for being our flag carriers. Well done to Aaron and James who received their training certificates from Nigel Valette for Scouts and Explorers respectively. 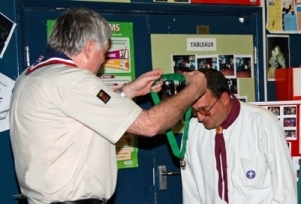 Dave Eacott, sectional assistant with Eagle Troop was presented with his 20 years Service Award to Scouting by Ian Hawke. Dave who started his Scouting career as a Leader in Hertfordhsire has been involved with Hayling Scouts for over 13 years. Thank You Dave!! This year our Xmas Card delivery service is 29 years old and again we need your help with the deliveries on Sunday 18th December. A letter with the details will be sent home shortly,but in the meantime all of the information is available on our website, including online booking. Well done to Chelsea George, Jake Whistlecraft, Mike Kenny, Barney Pycroft and Nathan Martyr of Nexus Explorers who completed their 3 day expedition towards their Chief Scout's Diamond Award and Duke of Edinburgh Silver Award. 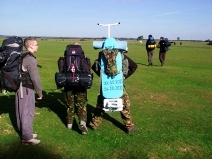 Their project was "Extreme Ironing" - and we will find out more soon! Congratulations and a huge thank you to our Dreadnought Active Support Unit on arranging a brilliant camp and activity weekend as part of the Jamboree On the Air (JOTA) and Jamboree On the Internet (JOTI). JOTA/JOTI is an annual event when Scouts from all over the world can communicate with each other over the air waves or across the Internet. Have you seen our list of Sponsors and Badge Sponsors under Sponsorship?.